The Haunting Of Hill House, is a Netflix horror series that’s been getting a lot of press time with how scary it is and how some people were freaking out over it. Some people couldn’t get pass the first episode, while others were just scared beyond belief. Apparently it’s suppose to be revolutionizing the horror genre, but I would be the judge of that. I am an avid horror movie fan and not much scare me when it comes to this genre. So, we will see how scary this new series really is. So a little backstory; The Haunting Of Hill House is a tv series adaptation of the 1959 book of the same name by Shirley Jackson. Apparently a lot of people had a lot of good things to say about the novel; Stephen King even stating that it is one of the best horror novels in the 20th century. It also has been described as one of the best horror novels to ever be written. With a review like that, by the horror novel genre king; Stephen King, and others, the series of the same name, has a lot to follow. From watching this new series on Netflix, it gives a feeling of a hybrid between “The Conjuring” and “The Woman in Black”. It revolves around the Crain family, who used to live in the most famous haunted house in the U.S; Hill House. Based on the novel, the mansion was built by Hugh Crain, a great ancestor to the Crain family. In the show, they reference the Hill family, hence; Hill House. While I write this and I am on the 3rd episode, there are creepy parts but nothing that we haven’t seen in the horror genre. I am hoping that eventually this “scary AF” series, really starts being scary. 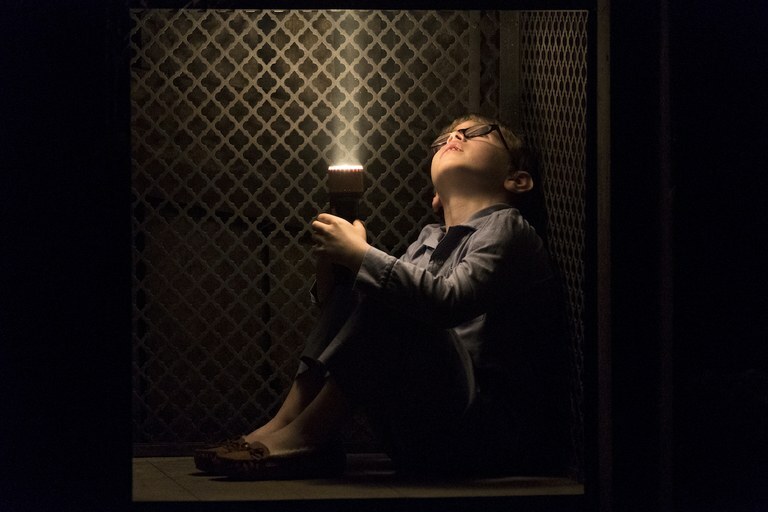 I would say though that The Haunting Of Hill House, does have a feeling of mystery surrounding the Crain’s children and what they experienced when they were all younger. As adults, we have a mortician, a writer, a junkie, a psychologist and someone who never really got over her fear of the things that go bump in the night. Finally, as I continued writing this review, the creepiness did start to intensify as the series continued and definitely is worth watching. Episode 4 definitely took the “holy sh*t”, to another level. I was saying it over and over again at the TV, during one particular scene which I would have to say is fricking crazy; definitely not a scene I would have looked at with all the lights off, that’s for sure. The Haunting of Hill House, definitely meets up to the expectations of what the viewers were looking for in this new Netflix original series. The only thing is, is that the story isn’t in any type of chronological order, even with the flash backs. Also a lot of times, we see scenes from previous episodes or scenes from earlier within the episode, popping back up; in a somewhat twisted deja vu. I am not sure what is the reason for this type of storytelling, but thankfully it doesn’t take away from the essence that makes this series so interesting. In fact, it allows for bigger stories to be told; not a necessary way to tell it but very interesting, to say the least. The horror genre is no longer about cheap jump scares, but a good story. It’s pretty hard to get the average movie goer to jump with a horror movie, so instead, the trick is now to get them thinking, get them wondering and get them believing the creepiness of a story. Without the story, the horror genre cannot survive. This is why such movies like The Conjuring, Insidious, and Annabelle – The Creation, are for me, the revival of the horror movie genre. They aren’t just about cheap scares, but building on a story that is chilling and nerve-wrecking. This is what The Haunting of Hill House, succeeds at. There’s no cheap jump scares, there’s no cliched scare tactics or attempts, but rather a very good horror story and well executed horror story. This horror series, didn’t depend on make up, CGIs or anything of the sort, to get the story across to its’ viewers. Instead, it went back to the basic; telling a creepy story in as much detail to the listener/viewer, that they just want to know more but afraid of what they will learn. So although The Haunting of Hill House, started off slow in the beginning with the first episode, the story built upon itself into something that Netflix definitely should be proud of. King said it right, this horror story, does have the potential to revolutionize the horror genre. Writers and producers, need to take notes from this horror story, and recognize what’s worthy of a horror movie/series nowadays. Cheap shots, and thrills don’t cut it anymore. In fact in this show, they are more subtle, and could sometimes be easily missed if you’re not paying attention, which is just fabulous to be honest. It means you have to pay attention, if you want to get the most out of this show. The writers of The Haunting of Hill House, have raised the bar for the horror genre, and as viewers we’re not expecting anything less! Make sure to check out The Haunting of Hill House, on Netflix! You wouldn’t be disappointed. I promise! Absolutely, beautifully, executed horror show, that’s definitely going to make me a harsher critique for anything in the horror genre that comes afterwards.